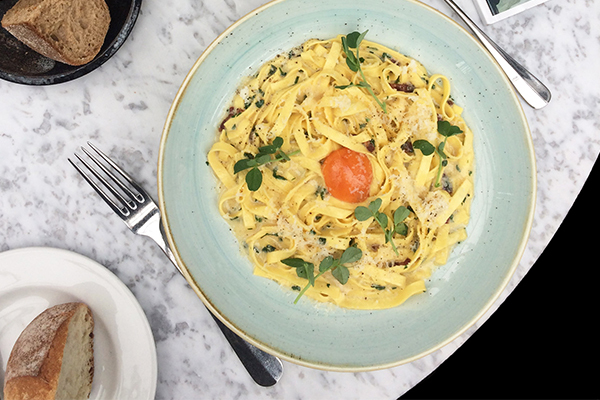 This isn’t your traditional carbonara. The classic version doesn’t contain cream, the sauce is made with parmesan and egg yolk, and spaghetti is commonly used. We have served this dish to conservative Italians here at Century and have got the thumbs up. So pennes at the ready! 1. Start with removing the skin from the pancetta, try to keep it in one piece so it is easier to remove at the end. Dice the rest in to small pieces. 2. In a large pan start with a high heat, cook the diced pancetta & the skin for a couple of minutes then turn down the heat down to medium-low until golden brown. 3. Remove the pancetta and excess fat from the pan and add your chopped onions, garlic, thyme, and bay leaf, cook gently until onions are cooked fully. 50 ml of water, cook for 5/7 minutes,add the cream and cook for a further 5 minutes set a side. 5. When you’re ready to serve, cook the tagliatelle in a large pot of boiling water, add 5 grams of salt per litre of water. Follow packaging instructions for cooking time and preferences. 6. While the tagliatelle is cooking, discard the thyme, bay leaf and pancetta skin from the sauce. Add the cooked tagliatelle to the sauce, toss for a couple of minutes so the pasta envelops some of the sauce. Add some of the cooking water, season and add the chopped parsley. 7. Top the carbonara with one egg yolk (optional), a twist of black peppercorns and generously sprinkle with freshly grated parmesan. The heat of the pasta will cook the egg yolk.